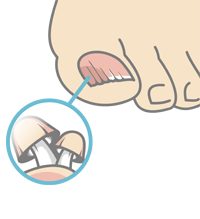 The classic pedicure has a nursing purpose, that is why all activities undertaken during the pedicure are used to obtain the best aesthetic effects. During the classical pedicure, traditional activities are performed, such as: cutting off the nails or removing unnecessary calluses combined with a relaxing massage or nail painting. This is completely different in the case of podological treatments, where the goals of care and aesthetic effects harmoniously combine with the most important task facing the podology, that is, diagnosing and treating problems arising within the feet and nails. When we are treating skin and nail diseases, all hygiene and safety rules must be followed. At the Satin Podology clinics,we always use sterile instruments or reusable instruments such as forehead tongs, side pliers, cuticle cutters, a two-sided probes, tweezers, cutters with diamond and steel embankment for the treatment of nails and skin. NIE!!! Thank you for your help. The problem with the painful corn has passed. I am after the first preventive treatment and I am very happy. I recommend the Satin cabinets to all my friends. I just finished the warts treatment. Thank you very much. I fully recommend satin clinics. 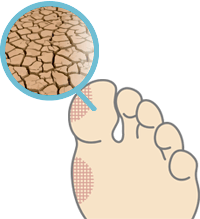 Warts on feet – why they arise and how to remove them? Certified specialists with many years of experience, instructors and lecturers. In a word – the best of the best!